This is the second in a two-part series of reports on the fast-growing Panamanian market. The first part looked at the opportunities for growth in Panama’s under-served long-haul market as in Nov-2013 Air France will become only the third carrier operating widebody services to Panama, joining KLM and Iberia. This part looks at the outlook for Panama-based Copa Airlines, which currently accounts for 86% of seat capacity at Panama City and continues to pursue rapid expansion. Copa has emerged as the leading carrier in the intra-Latin America market and has consistently been one of the world’s most profitable airline groups. Copa has successfully leveraged Panama’s strategic location in the middle of the Americas region and the superior infrastructure of Panama’s Tocumen Airport compared with other Latin American hubs. Copa Holdings is focusing on more rapid international short/medium-haul growth as it further cuts its domestic operation in Colombia and continues to rely on partner carriers to serve markets beyond the Americas. Copa Holdings is not among the largest of Latin America's airline groups and Panama City is not among the largest of the region’s airports. Tocumen is the 12th largest airport in Latin America based on current seat capacity while Copa is significantly smaller than the LATAM, Avianca, Gol, and Azul-TRIP groups. But Tocumen is the largest airport based on international capacity within the Latin America and Caribbean region. Copa is also the largest carrier based on the same criteria as, unlike Latin America’s larger groups, it allocates a very small portion of its capacity to the domestic market. Copa Holdings currently allocates about 8% of its seat capacity and 3% of its ASKs to the domestic market, according to CAPA and Innovata. Of the group’s international capacity, about 83% is allocated to routes within the Latin America and Caribbean region. The mainland US, where Copa recently added its eighth destination, accounts for almost all of the remaining 17%. Copa has been intentionally reducing its presence in the domestic market, which it sees as significantly more competitive and less profitable compared to Latin America’s international market. The intra-Latin America international market is essentially only served by three players – Copa, Avianca and LATAM. It is a market which is virtually untouched by LCCs, which account for over 60% of capacity in the region’s two main domestic markets of Brazil and Mexico. The barriers to entering the domestic market is much lower and as LCCs expand in the region they are more likely to increase their penetration in Colombia, which is the third largest domestic market but still has a LCC penetration rate of less than 10%, and enter new medium-sized domestic markets such as Chile, Ecuador and Peru. Copa is confident it can continue to build on its leading position in the intra-Latin America international market while continuing to avoid the prospect of LCC competition as most city pairs in the market are too small to support point-to-point service. In 2012, 52% of Copa’s Panama City traffic was transit and 76% of its passengers travelled on city pairs that on average have less than 20 passengers per day each way. The hub is unique and not easily duplicated as it offers the most convenient connections for hundreds of thin international city pairs within the Americas region. Avianca and LATAM subsidiary LAN have also developed and expanded intra-Latin America hubs in response to rapid growth for international travel within the Americas. But their hubs are significantly smaller than Panama City and face infrastructure constraints. Tocumen currently has 70 gates compared to 39 at Lima in Peru, 35 at Bogota in Colombia, 31 at San Salvador in El Salvador and 29 at San Jose in Costa Rica. Lima is a hub for both Avianca and LATAM subsidiary LAN while Avianca also funnels intra-Latin America passengers through Bogota, San Salvador and San Jose. Tocumen added 12 gates in 2012, when an expansion project at the North Terminal was completed. It has already started construction of an expanded South Terminal which will add another 20 gates. Tocumen is always working ahead of the growth curve while other hubs in Latin America are slow to increase capacity to meet current traffic levels. This gives Copa and Panama City a huge competitive advantage. Copa’s Panama City hub also offers a much larger network of destinations than other hubs with a higher average level of frequency. Copa currently has 31 non-stop international destinations from Panama City which are served with at least two daily flights. Avianca Holdings only has 12 such routes from Bogota, six from Lima and 13 from San Salvador while LAN has just nine from its hub at Lima. Panama City is also ideally located as it is within narrowbody range of virtually every city in the Americas. Unlike most other airports in Central and South America, Panama City is also at sea level, optimising aircraft range. Copa currently operates an all-narrowbody fleet consisting of 60 737-700/800s and 26 Embraer E190s (includes Panama-based Copa Airlines and Copa Colombia). It has no intentions of expanding into widebody aircraft or long-haul services as it still sees a huge opportunity for growth on short and medium-haul routes. Copa, which is a member of Star Alliance, is instead trying to entice other carriers from outside the Americas to serve Panama and leverage its regional hub. As analysed in the first report in this series, Air France will likely not be the only European carrier to launch services to Panama in the short to medium term. Asian and Gulf carriers could also be attracted to the Panamanian market. In addition to the huge number of regional connections available at Panama City, Panama is a growing local market in its own right. Panama has one of the fastest growing economies in Latin America, driven by expansion of the Panama Canal, and the emergence of Panama City as a financial centre and logistics hub. GDP growth exceeded 10% in 2011 and 2012 and Panama’s GDP is projected to grow by another 8% in 2013, more than double the Latin America average of 3.4%. Panama only has a population of about 3.6 million but serves as the regional headquarters for a growing number of multinational companies. Tourism is also expanding, leading to more inbound demand. A projected 5,600 hotel rooms are being added in 2012 and 2013. The rapid growth of the local market will help support Copa’s continued growth as well as help Tocumen attract more foreign carriers. Panama City is currently served by only 13 foreign passenger carriers, which collectively account for 14% of the airport’s current seat capacity. Copa is confident its existing Panama City routes will continue to support more frequencies as local and overall regional demand continues to grow rapidly. New destinations was the focus of Copa’s expansion in 2011 and 2012 but the carrier is now keen to turn its attention almost entirely to thickening existing routes. Copa is planning slightly more modest ASK growth of 14% in 2013 and will focus more on adding capacity to existing markets. So far this year only one new destination has been added, Boston, and one other destination, Tampa, has been announced. Boston was launched on 11-Jul-2013 with one daily frequency while Tampa will be launched on 16-Dec-2013 with four weekly flights. With Boston and Tampa, Copa will grow its network to 66 destinations (63 of which are served from Panama City) and nine in the US. In 1H2013, ASKs were up 19% year-over-year. RPKs were up 20%, a strong indication of the buoyant demand in the intra-Latin American market, as Copa’s load factor improved by 0.7ppt to 76.1%. The capacity expansion in 2013 is made possible by the delivery of seven 737-800s. Copa began 2013 with 83 aircraft and plans to end the year with 90 aircraft, including 26 94-seat E190s, 18 160-seat 737-700s and 46 160-seat 737-800s. The group plans to add another eight 737-800s in both 2014 and 2015. For now capacity growth in 2014 is expected to again be relatively modest by Copa standards because four 737-700s are slated to be removed from the fleet as part of the group’s focus on larger capacity narrowbody aircraft. But Copa always has the flexibility to accelerate expansion by leasing additional aircraft or accelerating deliveries. Copa CEO Pedro Heilbron told CAPA in Jun-2013, prior to the Tampa announcement, that the carrier will likely only add two but could add at most three new destinations in 2013. This opens the possibility of one more new route for Dec-2013. Copa typically expands its network around mid-year and again at the end of the year. He calls the 14% capacity growth figure for 2013 “more normal” as Copa looks to take a slight breather after the torrid expansion in 2011 and 2012. “You can’t always grow at a very rapid pace. The last two years we grew at 20% plus,” Mr Heilbron said. 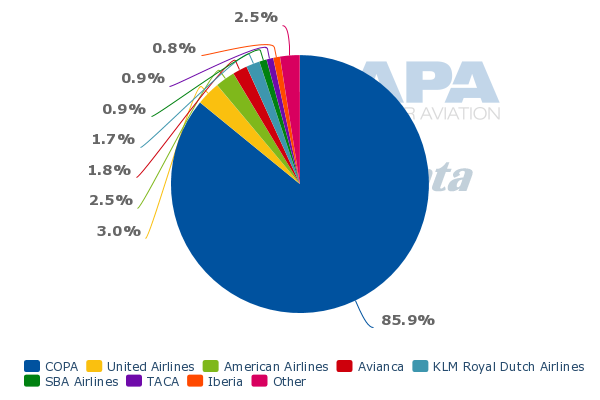 New routes will account for only 5% of the ASKs Copa adds in 2013. More frequencies on existing routes and the up-gauging of existing flights will account for 14% of the additional ASKs while the full year effect of changes implemented in 2012 will account for the remaining 81%. Copa added capacity on four routes from Panama City in Jun-2013, with a sixth daily flight introduced to Medellin in Colombia, a fourth daily flight introduced to Orlando in Florida and Punta Cana in the Dominican Republic and a second daily flight introduced to Port of Spain in Trinidad and Tobago. Another round of additional flights on existing routes is expected in late 2013. Copa sees opportunities to increase the thickness of several routes as 35% of its destinations have been in the network less than five years and are still in initial maturing phase. The carrier also currently serves 55% of its destinations once per day or less and is keen to offer passengers in these markets a wider range of flight times and a larger number of connecting destinations. Over the last several years Copa has already steadily expanded the thickness of most of its routes. As the hub becomes bigger and bigger, and as demand in both the local Panamanian market and the transit market for international services within the Americas region grows, this trend should continue. In 2006, Copa had only five destinations with more than two daily frequencies. Today it has 24 destinations in this category. Copa has consistently been one of the world’s fastest growing and profitable airlines. Between 2005 and 2012, revenues grew at an average rate of 20% per annum, ASKs by 17% per annum and RPKs by 18% per annum. During this period 34 destinations have been added. Copa has been able to cash in on a growth market which is under-served and has a remarkably small number of competitors along with a LCC penetration rate of virtually zero. The group has reported an annual profit margin exceeding 17% every year since 2008. It ended 2012 with an operating profit margin of 17.9%, which it expects to improve even further in 2013, to between 19% and 21%. Copa reported an operating profit margin of 22.2% in 1Q2013, up from 20.5% in 1Q2012, as the group’s operating profit increased by 28% to USD143 million, outpacing an 18% increase in revenues to USD543 million. The group plans to report its results for 2Q2013 on 8-Aug-2013. Organic and international expansion will continue to be the focus. Copa is not interested in following other Latin American groups in pursuing acquisitions and mergers, which in recent years has included LAN-TAM, Avianca-TACA, Azul-TRIP and Gol-Webjet. These mergers and acquisitions have created powerful airline groups but groups which are unable to come close to matching Copa’s industry-leading operating margin. All these groups are large domestic players, which impacts their overall profitability as several of the region’s domestic markets are intensely competitive. Copa has offered domestic services in Colombia since 2008, when it acquired a 100% stake in Colombian carrier Aero Republica. Aero Republica, now known as Copa Colombia, was previously only a domestic operator but has been used primarily by Copa to expand in the Colombia-Panama market. Copa links Panama City with Bogota and eight secondary cities in Colombia. It has successfully attracted a large amount of international passenger traffic from Colombia’s secondary cities which previously connected in Bogota. Copa and Copa Colombia combined currently offer almost 38,000 weekly seats between Colombia and neighbouring Panama, according to CAPA and Innovata data. Over the last 18 months the group’s Panama-Colombia capacity has grown by about 30%. It currently accounts for about 88% of total capacity in the market. Over the last year Copa Colombia has been reducing capacity in Colombia’s domestic market and re-deploying the capacity on Colombia-Panama routes. This has driven the increase in Colombia-Panama capacity and also has allowed Copa Colombia to take over almost all of Panama-based Copa’s Colombia flights. Copa says this has allowed the Panama-based carrier to redeploy capacity to other markets. International ASKs at Copa Colombia have grown by 94% since 2009. Copa Holdings says Copa Colombia will allocate over 60% of its capacity to the international market in 2013, compared to less than 50% in 2011. Copa recently reported an 8% drop in domestic ASKs for 1H2013, including a 19% year-over-year drop in Jun-2013. Copa in the first five months of 2013 accounted for only 6% of passengers in Colombia’s domestic market, according to Colombian CAA data. In the same period of 2012, Copa captured 8% of Colombia’s domestic market. Copa’s domestic passenger traffic shrunk by 8% in the first five months of 2013 to 537,000 million passengers. Copa Colombia has seen its market share in the domestic market decrease steadily since 2007, when the then independent Aero Republic captured more than 20% of Colombia’s domestic market. In 2012, Copa Colombia recorded an 18% drop in domestic passenger traffic to 1.5 million. But the carrier’s international traffic grew 35% to 1.4 million in 2012 and through the first five months of 2013 was up another 6% to 534,000. Panama-based Copa recorded a 31% drop in passenger traffic to Colombia in 2012 to only 132,000 passengers as most of its remaining Panama-Colombian flights were transferred to its Colombian sister carrier. Copa currently provides about 25,000 weekly seats in the Colombian domestic market, representing a 28% drop year-over-year, according to CAPA and Innovata data. Copa is planning to make a further small reduction in the Colombian domestic market over the next few months. Copa Colombia currently competes on seven domestic trunk routes from its Bogota hub. In addition to nine Colombia-Panama routes the carrier also operates point-to-point international services from Bogota to five destinations. But none of the latter routes are served with more than one daily flight and all the recent capacity increases at Copa Colombia has been allocated to the Panama hub rather than more point-to-point international routes, which were added in 2010 and 2011. Copa’s increasing focus on its Panama hub, which now accounts for 85% of the group’s seat capacity, is logical given the strength of the Panamanian market and economy. While the Colombian market and economy is also recording healthy growth, competition in Colombia is much more intense with Avianca, LAN and LCC VivaColombia all expanding ambitiously. Copa is better off staying out of this battle and trying to tap into the growth in the Colombian markets by offering more connections via Panama City. Copa is also better off trying to leverage its leading position in the rapidly growing intra-Latin America international market by pursuing more growth at Panama City. The group is rightly focused on putting capacity where it is most profitable. For Copa it is not about being the largest but about quietly building and cashing in its leading position in a market that is well positioned for high profitability, rapid growth and relatively limited competition. Given that its home market has a population of less than four million, Copa’s achievements over the last decade have been remarkable. But the opportunities for more growth and profits are clearly there as the Panamanian market continues to emerge as the Singapore of Latin America.